These borders were newly planted in the year 2000, and their plantings are continually changing. As a result the paths themselves have to take the odd new twist and turn. The main Hen House path originally formed a line between native plantings on one side and mass Rugosa roses on the other. In its early days it was wide and easily travelled, and made sense. In other words the plants by the edge were still rather small. After a year of growth and some rather indiscriminate plantings the path has become very overgrown. 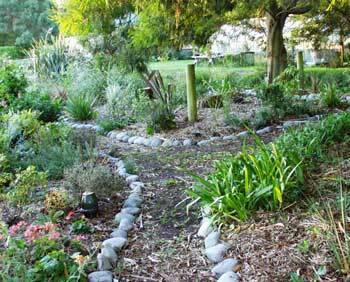 The original edging plants like Stachys had been swamped by lavenders and assorted perennials. The native area had been crowded by intruders, and the original intent of this path had been completely destroyed. The growth of a large upright Phormium (flax) has caused some curve remodelling, but the Toe Toe that I shifted in to hide the tree stumps is doing brilliantly. By luck rather than good design it was positioned back far enough from the path not to cut any passing visitor's skin. There have been many re-evaluations of these paths. In 2005 the main path was totally redirected, and the roses were thoughtfully spread out. 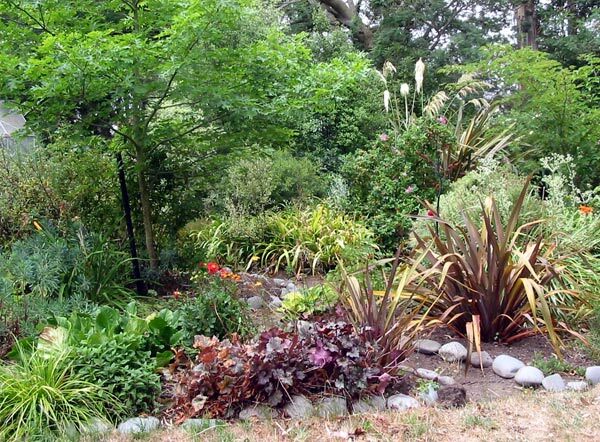 Some of the intruders in the native section of this border have found new homes. 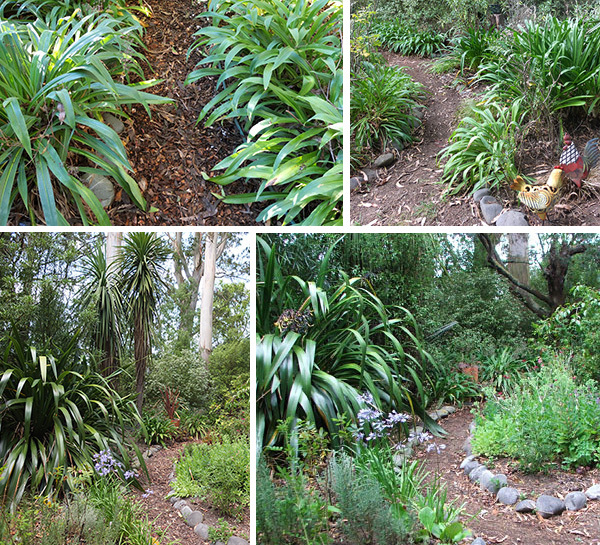 Change is one of the joys of gardening, and moving a stone edged path is easier than clipping back a flax bush. The main path's entry point from Duck-Lawn is constantly on the move. That large green Phormium seems to get floppier and floppier with every passing season. As well as getting quite a bit of trimming, the path stones have been moved away from it at least three times. It's far too easy to think of paths merely as ways to charge through a garden. I wish I had the nerve to make a path with a dead-end, or have one that doubles back and goes nowhere. Or for once a Moosey path might actually withstand the test of time and remain in the same place.